FRANKFURT -- A fixation on electric cars risks damaging Europe's supplier industry and handing jobs to China, the region's component manufacturers warned at the Frankfurt auto show. Suppliers, which say they provide about 5 million European jobs, want carmakers and politicians to look at other ways of cutting vehicle emissions too, such as more efficient combustion engines and synthetic fuels. 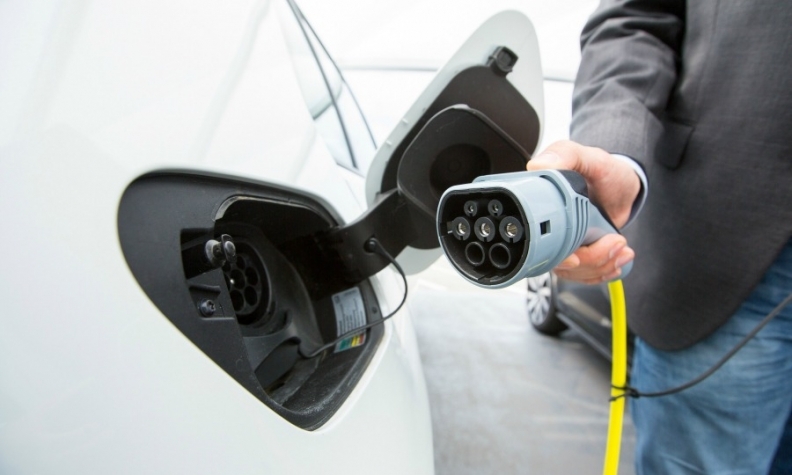 Roberto Vavassori, president of European Association of Automotive Suppliers (CLEPA) warned that a headlong rush to EVs would hand business to China, which along with South Korea and Japan dominate battery production for such vehicles. "We need to provide a sensible transition period that doesn't give unwanted gifts to our Chinese friends," he said, estimating European automakers were paying 4,000 to 7,000 euros ($5,000 to $8,000) to China for batteries for every electric car produced in Europe. Following Volkswagen's diesel-emissions scandal and big improvements in battery technology, many European carmakers are investing heavily in EVs. They are being encouraged by several governments, with the UK and France both recently announcing plans to phase out combustion engines by 2040 to try to cut pollution. Daimler and VW both announced plans on the eve of the Frankfurt show to accelerate their shift to electric cars. On Wednesday, the EU car industry lobby offered to further cut CO2 emissions, albeit over a lengthy period and dependent on uptake of electric cars. The manufacturers also, however, pointed to huge disruptions for both themselves and the supply chain. Daimler, for example, said it was seeking billions in savings to help fund the transition, while VW said it would tender for partners to provide battery cells and related technology worth more than 50 billion euros. On Wednesday, VW brand Chief Herbert Diess also echoed calls for German and European industry to unite to provide competition to Asian manufacturers in the production of electric car batteries. "It would be desirable for the German and European industry to play a stronger role here," Diess said. With European investment in battery technology lagging far behind China, many EU suppliers want the car industry to keep its options open -- even those also embracing electric vehicles. "The problem is the one-dimensional nature of the debate," said Volkmar Denner, CEO of Germany's Robert Bosch, the world's biggest auto supplier. Denner said Bosch was optimizing the combustion engine and also exploring synthetic fuels, which would have the advantage of being able to use existing filling stations and engines. "This is a faster way of limiting global warming," he said. "We are doing this alongside electric vehicles." The stakes are high, with the auto industry as a whole providing around 12.6 million jobs in the European Union, or about 5.7 percent of the total. Germany, home to some of the biggest industry players, has sounded much less enthusiastic about ditching the combustion engine. Chancellor Angela Merkel, campaigning ahead of Sept. 24 elections, has said she is "no friend of bans" and the car industry will need support in its transformation. Trade unions are pressing hard for jobs to be protected, from suppliers to manufacturers. "Self-contained value chains are a central pillar of our industrial model and play a big role in the success of the German economy," Joerg Hofmann, president of the IG Metall union, told steel and car industry members on Wednesday. CLEPA's Vavassori said Europe was lagging behind in the production of sensors and microchips, as well as batteries, and there was a risk in relying on Chinese supplies given geopolitical instability. "We need production in Europe for vehicles of future, or we put all Europe at risk," he said.